Percy is STARVING* and is expressing his anguish with all of the waggling his considerable ears can muster. He can keep this up for the full our between now and actual cat teatime at 5pm, his protest punctuated by a strident “MwaaaH” and finally a gentle claw in the backside. * For the benefit of cat-lovers, I should add that no cats were in fact starved to make this drawing, that there is actually still food in Percy’s bowl, and that as soon as this sketch was finished I walked Percy to his bowl and he began to tuck in, thereby ensuring me about 20 minutes peace. Percy likes me to accompany him to his dinner bowl at regular intervals throughout the day. 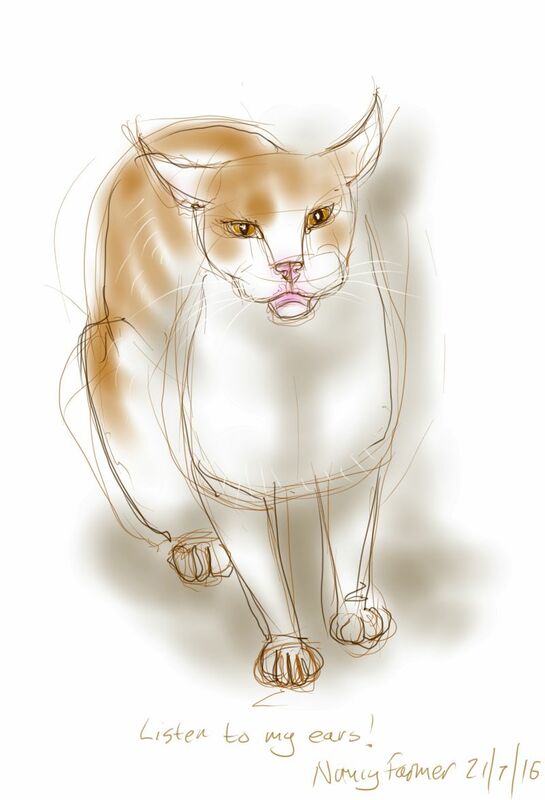 This entry was posted in Cats and tagged art, cat drawing, digital drawing, drawing, hungry cat, Percy Cat on July 21, 2016 by Nancy Farmer. They never do give up, do they… even when there is food in the actual bowl if they would only go and look!